14:34)? Does this mean that women cannot direct or sing in the choir? Answer: Interpreting this passage is complicated by the fact that it is in the context of a discussion of how speaking in tongues and prophecy were to be handled during the services of the Church, and yet because of the abuse of these practices by those who were suffering from spiritual delusion, the Church ceased to allow such things to be done in the context of the services altogether. Furthermore, because women who claimed to have the gift of prophecy were very prominent in the Montanist heresy (which began in the second century), in many of the comments about this passage you find in the Fathers, they are using it polemically. And so it may be that polemics led some to take the view that this passage means that women should refrain not only from speaking in prophecy or singing audibly in the Church, but even from praying audibly. However, this view was not unanimously held. “For there were, as I said, both men who prophesied and women who had this gift at that time, as the daughters of Philip, (Acts 21:9) as others before them and after them: concerning whom also the prophet spake of old: “your sons shall prophesy, and your daughters shall see visions” (c.f. Joel 2:28 and Acts 2:17 — from Homily 26 on 1 Corinthians). In his 37th homily on 1 Corinthians (which covers 14:34), he says that the prohibition is directed against women speaking “idly,” or “inconsiderately” (i.e. out of the proper order discussed earlier in chapter 14), but he does not suggest that the statement prohibits women who had the gift of prophecy from prophesying in Church. “If any man speak in an unknown tongue, let it be by two, or at the most by three, and that by course; and let one interpret. But if there be no interpreter, let him keep silence in the church; and let him speak to himself, and to God (1 Corinthians 14:27-8). Clearly in this case, St. Paul is not making an absolute ban on such a person speaking in Church — he is only forbidding him to speak in tongues if there is no one to interpret (in which case no one else would receive any edification). And so the silence is with regard to speaking out of good order. “Let two or three prophets speak, and let the others judge. But if anything is revealed to another who sits by, let the first keep silent. For you can all prophesy one by one, that all may learn and all may be encouraged. And the spirits of the prophets are subject to the prophets. For God is not the author of confusion but of peace, as in all the churches of the saints” (1 Corinthians 14:29-33). 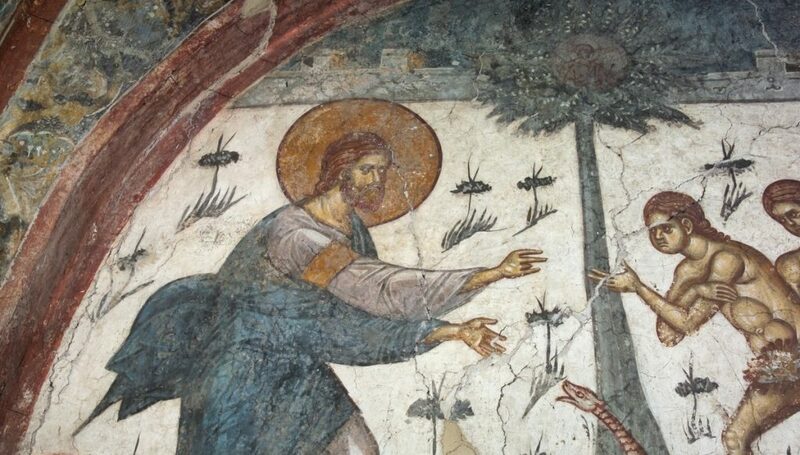 When it speaks of letting the others judge, this suggests that after a person would prophesy, others would comment on it — most likely this would have been done by those who had charge of the Church (certainly an Apostle, if present, and the local bishop, presbyters, and deacons). Probably some would ask questions about what was said. It is in both of these respects that St. Paul is telling women to keep silence, and if they had questions to ask their husbands about it later — but this meant keeping silence with regard to these specific things. And St. John Chrysostom’s comments about refraining from idle talk were certainly also applicable here. Of course, in our context, we would not allow either a man or a women to speak in tongues or prophesy in the context of a service, but the point is that the statement that women should keep silence was not an absolute prohibition against women praying audibly or singing. St. Ephrem the Syrian actually formed women choirs in Edessa (see “Spoken Words, Voiced Silence: Biblical Women in Syriac Tradition, by Susan Ashbrook Harvey). According to Fr. Robert Taft (a noted historian of Eastern Liturgics), there was also a woman’s choir in the Hagia Sophia (Interview of Sister Vassa Larin, “Orthodoxy is not a Religion of Fear”). 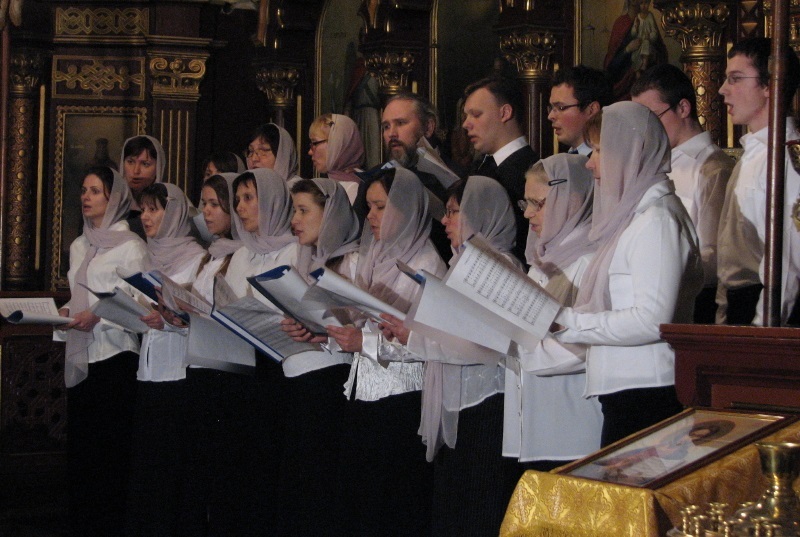 There are also long standing traditions of congregational singing, such as among the Carpatho-Russians, which obviously included women in the singing. 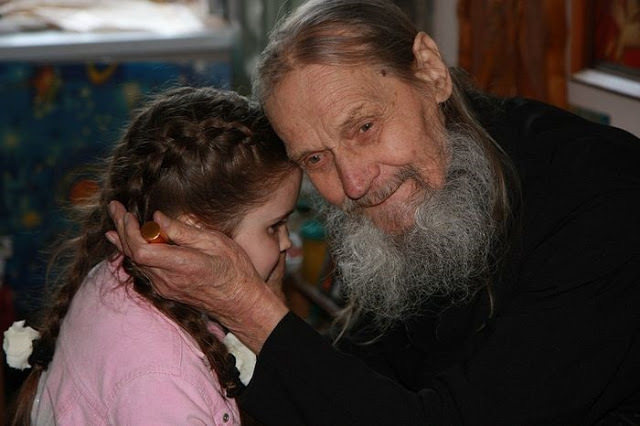 And those who have grown up in that context will tell you that this was one of the most powerful aspects of parish life. 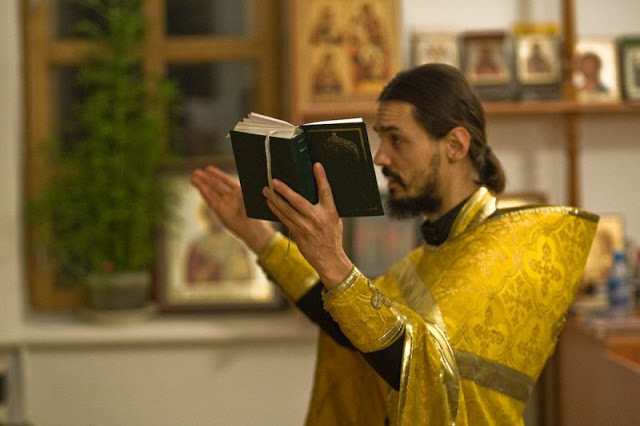 Furthermore, women have been singing in mixed choirs and even directing choirs in the Russian Church for a very long time now, and saints, such as St. John of Shanghai have not only raised no objections to it, but have blessed it to be so. So while one may make a case against women singing on the basis of the comments of some Fathers, the fact that the Church has allowed it, and that this has been without any controversy, and with the blessing of many saints should restrain anyone from making dogmatic arguments against the practice. 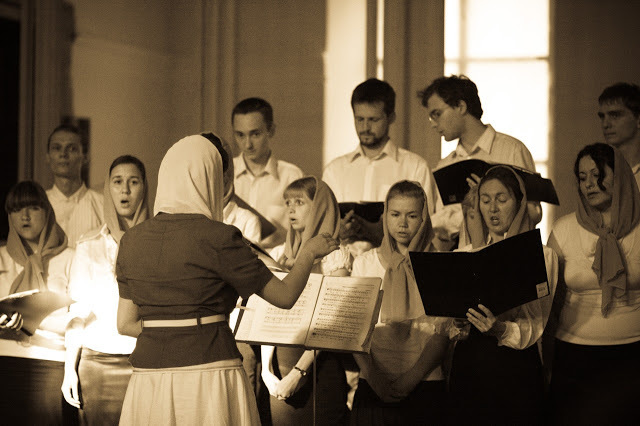 It is also a fact that without women singers and choir directors, many parishes would be hard pressed to pull off a decent service, and so even if you could make the argument that in an ideal world, choirs would consist of only tonsured male readers, the problem remains that we do not live in such an ideal world, and have to use the resources that we have. St. Paul’s concern in his first epistle to the Corinthians was that “all things be done decently, and in good order” (1 Corinthians 14:40). If our interpretation of his admonitions leads us to the opposite effect, then I would suggest this means we are misreading him on some level. When a baby girl is baptized, she is Churched. And in that service, the priest brings her into the middle of the Church and says “In the midst of the church shall she sing praises unto Thee” (c.f. Psalm 21:22). It is hard to imagine why we would say this if we did not intend that it should actually happen.